Let’s cut to the chase. It seems like so much healthy food these days is totally boring. And you know what? I don’t like boring. I’m all about adding fun and sophistication to delicious and natural foods. Known as “Betsy Crocker” since my sorority days, I was always finding creative ways to make tasty - yet healthy - food for my friends. And one day it hit me, why not make my unique gourmet foods available to everyone? So began Betsy’s Best Gourmet Nut and Seed Butters. I only use wholesome, natural ingredients in my Gourmet Peanut, Almond, Cashew Butter, and Seed Butter, mixed with unique flavors like cinnamon and chia seeds, to create products that are totally nutritious, delicious and different. My only real worry? My Betsy’s Best products are so addicting, you’ll have a hard time sticking to one serving. So as any good dietitian would tell you, practice portion control! Peanut Butter goes gourmet with this sophisticated and tasty, sweet and salty treat. Dollop it onto bananas, whole grain bread, or by the spoonful. 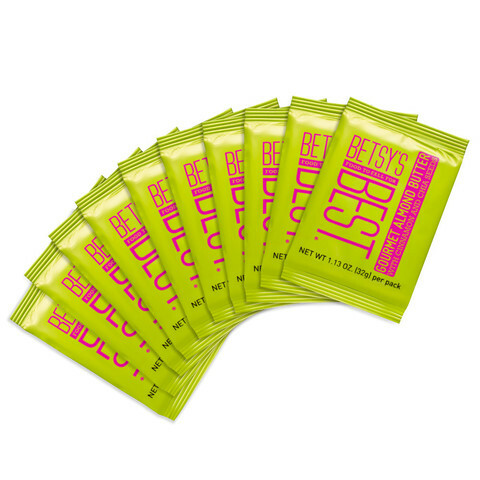 Box of 10 single-use gourmet peanut butter pouches. Almond Butter goes gourmet with this sophisticated and tasty, sweet and salty treat. Dollop it onto bananas, whole grain bread, or by the spoonful. Pack of 10 single-use pouches. Sunflower seed butter needed a gourmet brand and here it is. Sophisticated and sassy, sweet and salty, Betsy's Best is bound to be your favorite. Dollop it onto bananas, whole grain bread, or mix it into any healthy smoothie. This seed butter is super tasty and certainly not boring. 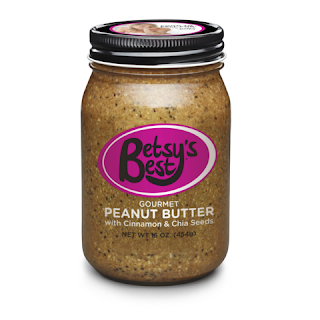 Betsy’s Best Gourmet Seed and Nut Butters are delicious! I love that they're gluten free, all natural and non-GMO. 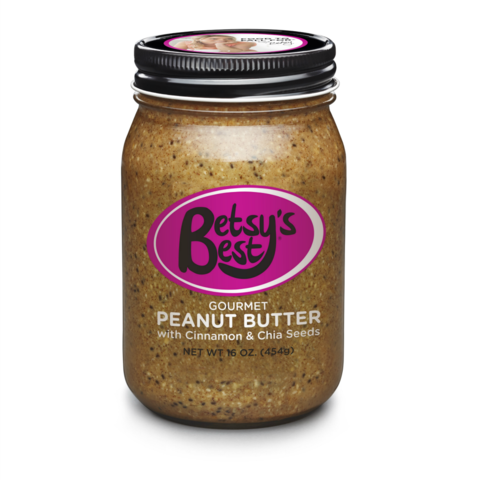 Betsy’s Best Gourmet Peanut Butter is incredibly delicious. I love the chia seeds throughout and cinnamon adds the perfect flavor. I've never had cinnamon and peanut butter but it tastes wonderful together. Betsy’s Best Gourmet Almond Butter is fantastic. I was never a huge fan of almond butter but I love this almond butter from Betsy's Best. The flavor is so good! Betsy's Best Gourmet Sunflower Seed Butter is wonderful. Sunflower seeds aren't my favorite but Betsy's Best has turned them into something special with their Gourmet Sunflower Seed Butter. I've actually been eating this straight out of the packet because it's so good. I highly recommend Betsy’s Best Gourmet Seed and Nut Butters! Click HERE to find a store near you that sells Betsy’s Best! Click HERE to learn more about Betsy’s Best! Follow Betsy’s Best on social media!